Sri Lanka’S earlier president needs to be tries as state sponsored terrorism. UN releases war crimes report on Sri Lanka urging hybrid war crime court. Probe likely upon the killing of 200,000 mainly ethnic Hindu Tamil minority during 1983 – 2009. 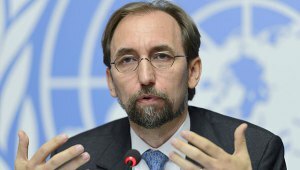 HENB | New Delhi | Sept 18, 2015:: On Sept 16, the UN High Commissioner for Human Rights Zeid Ra’ad Al Hussein finally released the Sri Lanka war crimes investigation report prepared by his office. The nearly 300-pages reports declare that “serious war crimes” and “human right violations” were committed by the Sri Lankan military tagging the activities of the separatist Liberation Tigers of Tamil Eelam (LTTE) during the island’s 26-year war. This entry was posted on September 18, 2015 by Sanatan Dharm and Hinduism in HINDUISM SCIENCE.